The JBC has decided to start structuring the paper a little better. The new topics will be Top Stories, Peach Creek health news, Peach Creek business, Business Ed, and of course your favorite Ed-vertisements. If you would like to see anything added please add it to the suggestion section. This way it is easier to understand what is going on. 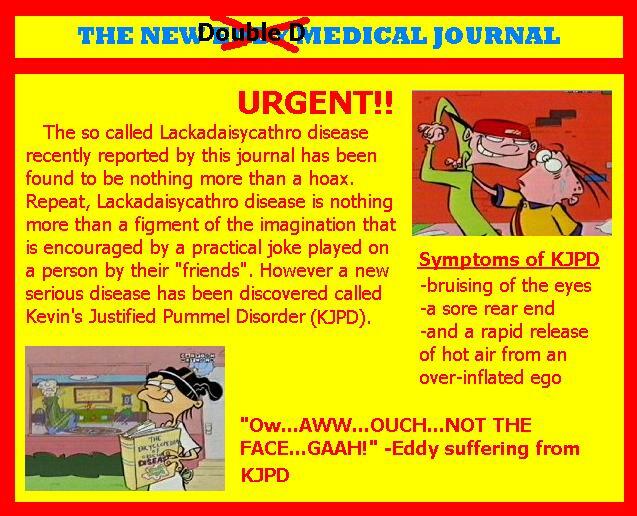 A newspaper for the Eds done by the Ed fans!! Recently the Eds have tried to establish themselves as a superior band. However their dream did not last long. This whole situation first started when Eddy decided that he wanted to become rich. So without thinking he decided to make a band. The band consisted of Ed, Edd, and of course Eddy. The name of the band was The Three E's. Without any practice sessions or knowing how to play the instruments the Eds performed their first concert infront of the Culde-sac. Kevin:"Those dorks really stunk everything up!" The Eds didn't last long as there loud blare of so called music disrupted the peace of their neighbors. The band quickly broke up after their first and last concert. 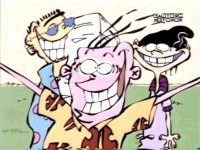 Eddy claims that it was Edd's fault for why they were not a hit. But still it shows that Eddy really doesn't have much common sense at all. The Eds have been caught sellingfake candy to the kids. They have been filling up boxes with mud and lying saying it was real candy.Well now the scam is over and the eds have failed again. Thus making them look like idiots. They also took a beating, and the unhappy customers threw the mud at them and demanded a refund. Eddy was quote saying "It looked like a good idea in the beginning." Well all of there scams do and this one really proved that. No matter what scam they try something always goes wrong. 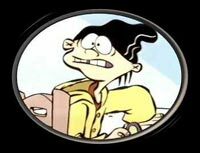 Edd doesn't really match well with Ed or Eddy so I decided to find out what Edd thought. So I did an interview with him on AIM. Clown7253: Why are you friends with Ed and Eddy? they seem to be your exact opposites. Eddwardthegreat: Well, how very right you are about that. Eddwardthegreat: It's not easy to explain either, but we all like jawbreakers, and so I guess since we have one thing in common, we're able to get along so well. Yet another reason, Eddy, Ed and myself , would of been loners. Clown7253: I see, exactly how long have the three of you been friends? Eddwardthegreat: Seems like we've been friends forever. Clown7253: Have you ever thought of abandoning them in the past? Eddwardthegreat: Yes, actually I have. Clown7253: Interesting, what was the situation? Eddwardthegreat: When I wasn't feeling well, and Eddy and Ed were dragging me along with them to work on a scam. Eddwardthegreat: I felt like they didn't care if I was ill or not. Clown7253: Have they ever abandoned you in the past? Eddwardthegreat: No, of course they haven't. Clown7253: Would you abandon them if they went too far? Eddwardthegreat: If I had no other choice, yes I would. Clown7253: Ok, tell me, what action would be going too far? Eddwardthegreat: Well, If I was badly injured and couldn't get out of bed, and they came and dragged me along, then I would have no choice but to leave them. Eddwardthegreat: That, to me is going too far. Eddwardthegreat: Now don't you agree? Clown7253: Have you ever imagined life without Ed or Eddy? Clown7253: What was it like? Eddwardthegreat: Well, I was still a dork to everyone, but alot more popular than I am now. Eddwardthegreat: And I can see Ed nothing but Sarah's slave, getting pushed around all day. Eddwardthegreat: And Eddy, just a punching bag for Kevin. Eddwardthegreat: But it would be a lot worse without me. Peach Creek Estates has been silent for the past two years as no construction work on the houses has yet to be done. Finally PCE has started back up on the project again and hope to be finished in the next couple of months. Improvement has been seen as new equipment has been placed in the construction site as well as new frames for the houses. Throughout the day the neighbors of Peach Creek can hear the pounding of the hammer or the roar of the saw. No houses have been completely finished yet but progress is occuring at a very slow rate. For everyone that bought a house there they are starting to get a little impatient. But they are glad to see that production is starting again at PCE. Still they want there houses now. After the houses are built the construction zone will dissapear from the neighborhood forever which the kids are quite sad to hear. However the production has silenced once again and should start again in the next couple of weeks. At least they hope.When people read Buy Now Pay Later they had no idea that they meant that long. The Eds finally were able to kick the Kankers out of their club house last Tuesday and immediately began fixing it up. 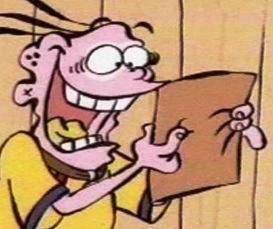 Edd: "Our plan is to spruce this place up and find some members to join our organization"
Ed: "It has a roof!" Eddy: "People will pay big to get into our club." The Eds Pest Control. When somethings bothering you just call us and we will get rid of them for a small price of 25 cents!